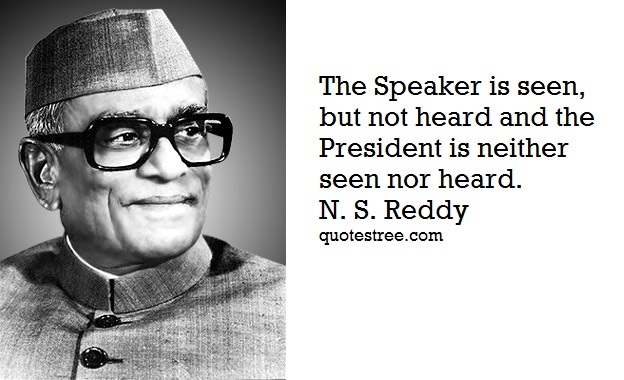 Neelam Sanjiva Reddy was sixth President of India. He was the youngest person to hold the Presidentship of India at that time. He was in office from 1977 to 1982. He also served as the Chief Minister of Andhra Pradesh for two terms, Speaker of Lok Sabha (House of Commons) and Union Minister of India. Without fear or favour whatever successes I have been able to make of my life, I owe to the leadership of Mahatma Gandhi who could make man out of dust. I was greatly inspired in my youth by a remark Jawaharlal Nehru had made, ‘Success comes to those that dare and act...’ In fact this remark was my motto in life. Despite perplexing diversities, our people retain a remarkable dynamism and spirit of adventure. Our resilience springs from our well-established traditions of patience and perseverance, tolerance and compassion... and it is to this eternal and immortal India that we rededicate ourselves today. The President of India is the constitutional head , who has no policy and programme of his own. It is the Government of the day which chooses the policy and programme to be pursued within the framework of the constitution…[would] protect and defend the Constitution. Madame Prime Minister [Indira Gandhi] do not mislead the house or the Honorable Member. The speaker has no hand to sending the Members of Parliament. He only comes to know from the news papers the next day as to which delegation is going outside the country. It is unfortunate that the Prime Minister has unnecessarily dragged the name of the speaker in the matter. 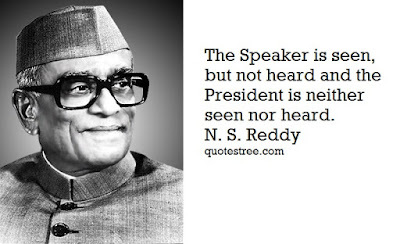 The Speaker is seen, but not heard and the President is neither seen nor heard. In June 1977 or thereabouts, while I was still Speaker of the Lok Sabha, I wanted to go to Bombay during a weekend to call on Jayaprakash Narayan who had come back from the United States after medical treatment. I thought I might mention the matter to Prime Minister, Morarji Desai. His reaction was uncharitable to Jayaprakash Narayan as it was unworthy of him. He asked me if it was really necessary for me to “Lionize” JP. It is an admitted fact that JP’s prominent role in bringing opposition parties together under one banner was widely acknowledged. It was also well-known that JP had been instrumental in Desai’s becoming Prime Minister. I recalled to him [Morarji Desia] our long association in the freedom movement and after and how I always treated him as an elder brother. I pointed out, however, that in the national interest a distinction had to be maintained between personal relationship and public responsibilities in the discharge of our duties. I referred to the growing disenchantment and disillusionment of our people.